House Speaker Paul Ryan of Wis., center, accompanied by his Press Secretary AshLee Strong, right, walks to the Capitol Building from the Capitol Visitor’s Center, Thursday, Jan. 18, 2018, in Washington. 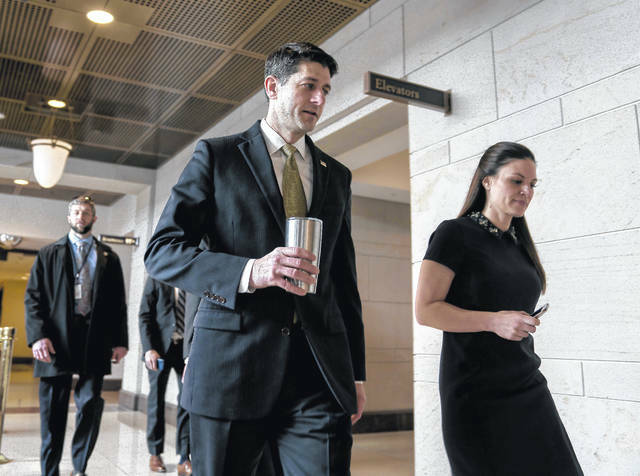 WASHINGTON (AP) — A divided House voted Thursday to prevent a government shutdown after an eleventh-hour deal brought conservatives aboard. But the GOP-written measure faced gloomy prospects in the Senate, and it remained unclear whether lawmakers would be able to find a way to keep federal offices open past a Friday night deadline. House passage was assured after the House Freedom Caucus reached an accord with House Speaker Paul Ryan, R-Wis. The leader of the hard-right group, Rep. Mark Meadows, R-N.C., said Ryan promised future votes on extra defense spending and on a conservative, restrictive immigration bill, though a source familiar with the discussion said Ryan didn’t guarantee an immigration vote. That person was not authorized to speak publicly about the private negotiations and spoke on condition of anonymity. Meadows also spoke to President Donald Trump. Just 11 Republicans opposed the measure, mostly conservatives and a pair of moderate Hispanic lawmakers. Six Democrats, a mix of Hispanic and moderate legislators, backed the bill. But most Senate Democrats and some Republicans were expected to vote no when it reaches that chamber later Thursday. Democrats were hoping to spur slow-moving immigration talks, while a handful of Republicans, including Sen. Lindsey Graham, R-S.C., were pressing for swifter action on immigration and a long-sought Pentagon spending boost. The GOP controls the Senate 51-49 and will need substantial Democratic backing to reach 60 — the number needed to end Democratic delaying tactics. Republicans were all but daring Democrats to scuttle the bill and force a shutdown because of immigration, which they said would hurt Democratic senators seeking re-election in 10 states that Trump carried in 2016. Underscoring the political stakes, Senate Majority Leader Mitch McConnell, R-Ky., warned GOP senators in an email obtained by The Associated Press that voting against the measure “plays right into Democrats hand” — presumably because it would dilute the argument that Democrats killed the legislation. Democrats said voters would fault Republicans because they control Congress and the White House. They also noted that Trump rejected a proposed bipartisan deal among a handful of senators that would have resolved the conflict over how to protect hundreds of thousands of young immigrants from deportation. Barring a last-minute immigration and spending pact between the two parties, lawmakers said a measure financing agencies for just several days was possible to build pressure on negotiators to craft a deal. Also imaginable: lawmakers working over the weekend with a shutdown underway — watched by a public that has demonstrated it has abhorred such standoffs in the past. Hoping to garner more votes, Republicans added language providing six years of financing for the children’s health program and delaying some taxes imposed by President Barack Obama’s health care law. The health program insures nearly 9 million low-income children, and some states have nearly exhausted their funds. Most Democrats remained opposed, saying they’d relent if there also was a deal to protect around 700,000 immigrants from deportation who arrived in the U.S. as children and now are here illegally. Trump has ended an Obama-era program providing those protections and given Congress until March to restore them. “If this bill passes, there’ll be no incentive to negotiate, and we’ll be right back here in a month with the same problems at our feet,” said Schumer. Immigration talks among top lawmakers and White House officials have moved slowly. Trump and Republicans want it to include money for the president’s promised wall along the Mexican border and other security measures.